Twilight Sparkle feels uncertain about her role as a princess, and the return of an ancient evil requires the aid of an unlikely ally. A solid season finale, I thought. They wrapped up a few plot threads without rushing the pace, and made what look to be some lasting changes to Ponyville. I thought it was a much better season finale then last season. I wonder if the rainbow power transformations were leaked earlier this year. Similar to how Twilight's wings were leaked about midway through season 3. An artist on DeviantArt has been posting Equestria Girl versions with very similar look and feel as the transformations. As far as I can tell they have no ties to the creators of the show.. I feel like Tirek's character.. or his voice actor or something is a reference to some other show or story. You know what bothers me more then anything? That Twilight is slightly taller/bigger then the rest. I know it's an Alicorn thing but it still bugs me. Apparently Tirek was a villain from the 1980s cartoons. Oh that's awesome. I wish they were able to do more with the old series/movies. Tirek's inclusion was indeed amazing. Some time back for a failed fan project I worked up a riffing script for the pilot to the original My Little Pony. Tirek was the villain in that one, and damn it, he was awesome. 80s cartoons could be unexpectedly metal, and Tirek was more metal than the freaking Transformers. A giant orange centaur with a horde of orcs serving him, who fondles and talks to a creepy bag on a rope around his neck that beats like a heart -- not a Valentine's Day one either. It contains his "Rainbow of Darkness," that basically exists to turn things into heavy metal album covers. Tirek turned the prior king of the land into a creature called Skorpan (also referred to in the episode), then hired him under duress as his second-in-command, which might seem like a bad career move, and indeed is a factor in his eventual downfall, but that situation must have persisted for a long time before, with Skorpan too afraid of Tirek's might to rebel. He probably did try to rebel once, judging by Tirek's mocking words to him. The coolest thing about old Tirek though is his voice. He absolutely had the most bitchin' voice of evil of all. It's really a shame the old show tended to create villains only to discard them after one use, a tendency I've noticed FiM, with the exception of Discord, has continued. Part of Discord's popularity is because of John de Lancie. 80's cartoons had some crazy evil villains. I did not see Dragonpony Z coming, but I giggled none the less. 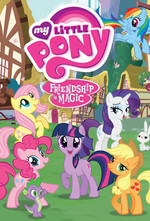 I guess it's also safe to admit here… I choked up a little when Celestia, Cadence, and Luna gave up their magic. I actually gasped when they showed Celestia's blank flank. Which is to say, I actually think it got a little intense for a TV-Y show meant to be watched by children as young as 2. They looked so incredibly sad to see their cutie marks go away. I am happy we got a very short couple of lyrics from Cadence though. I love her voice. This Day Aria was one of the best songs in MLP, in my opinion. I really enjoyed the finale and this season in general. Maud Pie was my favorite episode since the first season. I was really happy with this finale. Loved the pathos of the de-magicked Princesses. Now that we have had all Princesses singing, surely we can get a Celestia/Luna duet in S5? If it's not a back-and-forth, whatever-you-can-do-I-can-do-better kind of thing, they're missing an opportunity. That would be the stuff of legends.